There being so much talent in the tattoo industry nowadays, the style and uniqueness of Eddie “Edball” Tana is what makes him stand out amongst the best out there. Born in Saigon, Vietnam in 1974 his parents moved the family to the US in search of a better life. Growing up in Fullerton, California Eddie always had and showed ambition for independence and freedom of expression. Though there was no direct influence in arts from home, at the age of 15 Eddie began to be fascinated by art, particularly street art and tattoos. With tips from older and more experienced tattoo artists Eddie began practicing his artwork and by the age of 18 sold his car to afford his first tattoo kit and begin what would become a gateway to his success, tattooing. First working on friends, soon enough Eddie was known as the go-to guy for all tattoo styles in Fullerton. In 1994 tattoo artist and friend, Bob Nguyen now owner of Bad Influence Tattoo invited Eddie to join him working in Hollywood, beginning his apprenticeship in Boulevard Tattoo with German native tattoo artist, Uwe (RIP). Working there for 3 years and moving on to Studio City Tattoo for 1 ½ years gave Eddie the advantage of learning from artists such as world renowned Austrian tattoo artist Pogo, Baby Ray (Spotlight Tattoo), independent tattoo artist Nina Depezo, Danny Wild (Tattoo Mania), Randy Howell (Hot Stuff Tattoo), Slick Rick (North Shore Tattoo), Rockwood (Studio City & Big Island Tattoo) and Jonas Westernland, Clay Decker (True Tattoo) would give a few tips as well. By 1999, he opened his first tattoo shop along with friend Bob Nguyen calling it, “Addictions Tattoo Inc.” in Orange County. By 2003 he left Addictions to open up the world famous and finest tattoo shop in the Southern California area, OC Tattoo Inc. . Obtaining plenty of experience artist and working close with other artist like Arnold Santos (Lefty’s Tattoo San Diego) giving Eddie the opportunity to become a top of the line tattoo artist specializing in Japanese artwork and having a positive impact on his peers and clients. As side his local and loyal clients Eddie has also inked celebrities like Tyrese Gibson (Singer/Actor), John Rzeznik (Goo Goo Dolls frontman), Wilford Brimley (Actor), Kenny Miller (Blood Shot Clothing Inc.), Tyler Evan (Motorcross), Troy Hoff (stuntman), MMA Fighters: Quinton “Rampage” Jackson, Tim “Big Perm” Persey, Nam Phan, Justin Levens (RIP)and Johnny “knee” Dinh. Taking advantage of the opportunity to work in Hiratsuka, Japan as guest artist at “Homies Tattoo” from 2006-2007. Upon his arrival back in OC and realizing the lack of tattoo supplies available through suppliers, Eddie set his sight on becoming the best tattoo supplier in the country and officially opened for business Element Tattoo Supply in June 2008. Now doing his share in the tattoo industry for over 10yrs, I have been feature artist in magazines such as Inked, Lowrider and many Japanese Magazines, not to mention his OC Tattoo Shop praised as best in OC by OCweekly. Having overcome many obstacles life has brought, he has achieved all his success and is still the modest and down to earth guy he’s always being. Now Eddie still works out of his OC Tattoo shop (appointment only) and is looking to expand the shop to have a special station only for guest artists and also opening a 2nd tattoo shop in Costa Rica. Though it may seem he’s reached the top, Eddie is aware there’s much more to accomplish, he just hasn’t figured it out yet. As for OC Tattoo Eddie has done many things not of the norm of tattoo shops around. He sponsors everything to bring his tattoo shops name up from bands like “A Thorn For Every Heart” “beauty School Drop Outs” ” Almost Home” Professionl Poker players like “Tim Phan” , Fighters Like “Quinton Rampage Jackson” just to name a few. Eddie is always looking out for new talent and is making his mark in everything he puts his heart to. Joshua Carlton has been tattooing for the last 25 years, and painting for 10. He is the author of the best selling book ‘Advanced Tattooing Techniques; A Guide to Realism’ and has also produced a series of DVD workshops ‘In the Studio with Joshua Carlton’ in which artists can watch as he tattoos and explains his different techniques. Throughout his career Joshua has striven to push the boundaries of tattooing into the realm of the fine artists that he has always admired. After extensive travelling and tattooing all over the US Joshua now calls Eugene, Oregon home. Here he resides with his family and plays guitar with his band This Patch of Sky. Indiana born and raised, Nichole Carlton has been heavily involved in the tattoo industry for the last 13 years. At 19 Nichole opened a successful wedding photography studio, then after having her first born, Penelope, decided to move on to new horizons. Working closely alongside her husband Joshua Carlton, Nichole produced ‘100 Faces of Mary’, an art book which showcased over 100 tattoo artists’ depiction of The Virgin Mary. Along with the release of the book Nichole also curated an art show at Transcend Tattoo Gallery in Branford, CT. She is excited now to focus her energy on the Evergreen Tattoo Convention, a goal that she has shared with Joshua coming to fruition. Nichole now resides in Eugene Oregon with Joshua and their two children. When she’s not working on the convention she is working ‘behind the scenes’ handling the business side of Joshua’s art, or spending time with her family or in the garden, always with coffee in hand. As a tattoo collector Riley researched the origins and traditions of tattooing. His research grew into a passion and led him to find an apprenticeship and get his own license to tattoo in Oregon. After several years tattooing in “street shops” and with a strong belief in the sacred traditions of tattooing, Riley continues to grow as an artist. He tattoos regularly at his own shop as well as operating the Lifetime School of Tattooing. Riley’s graduates are working at prestigious shops all over the state and the school always has a waiting list for new enrollments. Riley’s graduates hold their own next to the best artists at tattoo shows all over the northwest region. Riley is proud to pass on the sacred traditions of tattooing to all of his students and provides them with more than just what is needed to get a license. With a staunch character and sense of civic responsibility Riley proudly served two consecutive terms on the Springfield Art Commission, where he strived to open conservative eyes to tattooing as a true art form, and to pull down local stereotypes and cross culture bias. Riley continues to stay abreast of local politics and works with his local branch of Neighborhood Watch and the Springfield Police Dept. trying to help keep the peace and uphold family values. He is also a member of the Springfield Chamber of Commerce and the Alliance of Professional Tattooists. Hard as a rock and stubborn as a mule, Riley would not take no for an answer from anyone and believed from the beginning conceptualization with his wife Erin, and with Joshua and Nichole Carlton, that they could make the Evergreen Tattoo Invitational one of the best and most highly acclaimed art festivals held anywhere, and that it would be just one more pathway for him to pass on the sacred traditions of tattooing. Erin Smith is the co-owner of Lifetime Tattoos, Queen Bee Tattoo and Gallery, Stay Gold Tattoo Gallery and Supply. Erin also serves as Director of the Lifetime School of Tattooing in Springfield Oregon. Erin takes a personal interest in each students preparedness for the Oregon state tattoo licensure examination going so far as to drive graduates to the state capitol along with a full copy of their transcripts to ensure the testing, and associated red tape all flow smoothly. Erin and her husband Riley have a wonderful 10 year old son named Patton whom they adore. She recently graduated from Lane Community College where she studied Art and Business. As a standout in the art department several of her sculptures and other artworks were often highlighted in campus displays. She recently obtained her own Oregon Tattoo license, but between being a mom, running the shop, tattoo school and planning the convention she doesn’t have much time for tattooing. She does find the time somewhere to take a lead in civic duties, and was recognized by the Springfield Neighborhood Watch with their “Good Neighbor Award” which was presented to her by the Chief of Police at a citywide celebration. 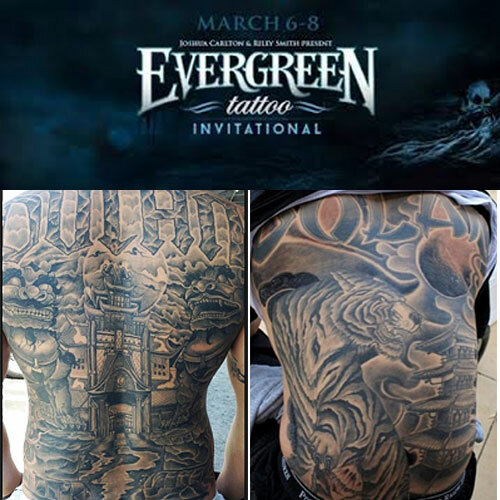 Erin is thoroughly involved in all aspects of the Evergreen Tattoo Invitational and believes that to make it the best show for the best artists it is her responsibility to make sure all bases are covered and that all invited artists get the personal attention they deserve.